Focus of the week: This week we focus on the mortgage and rental affordability indices in the Nairobi Metropolitan area. Treasury bills subscriptions remained high, rising during the week with the total subscription rate coming in at 307.2%, compared to 246.5% the previous week, on the back of increased liquidity in the money market. Subscription rates for the 91-day, 182-day and 364-day T-bills remained high at 563.0%, 292.5% and 151.4% from 467.2%, 187.1%, and 158.8% the previous week. Yields for the 91 day, 182 days and 364 day papers remained flat coming in at 8.8%, 10.7% and 11.8% from 8.9%, 10.9% and 11.8% last week, an indication that yields have stabilized at the current levels. According to data from Bloomberg, yields on the 10 year and 5 year Kenyan Euro bonds issued in 2014 have also come down by more than 200 bps since their peaks in mid-January 2016. However, yields have remained stable during the week trading at 7.6% and 6.1% at the close of the week, respectively highlighting the improved economic climate with the declining interest rate environment since the start of February 2016. This spells good news to the government as it embarks on the Eurobond roadshow to gauge investor appetite. On the back of a liquid money market, the interbank rate declined to 3.74% from 4.14% the previous week. Liquidity in the market was as a result of (i) Reverse repo purchases of Kshs 14.2 bn, (ii) Bond redemptions of Kshs 12.1 bn during the week, (iii) T-bill maturities of Kshs 9.0 bn during the week, and (iv) Continued flight to safety by investors, who have shown preference to government securities after the placement of Chase Bank under receivership. The above maturities amounting to Kshs 35.3 bn, compares to total borrowings during the week of Kshs 29.2 bn, following the Treasury accepting Kshs 9.6 bn from T-bill auctions and Kshs 19.5 bn from the issued 5-year bond. The shilling has remained stable during the year appreciating by 1.1% YTD, strengthening marginally during the week to close at Kshs 101.1 from Kshs 101.2 the previous week. In the short-term, as (i) corporates go into the dividend-paying season, and (ii) importers close their end of month positions, we expect a mild spike in demand for the dollar, which may result in mild downward pressure on the Kenya Shilling, leading to a slight depreciation. This week, the government issued a 5-year Treasury bond, offering a total of Kshs 20.0 bn for budgetary support. The total subscriptions came in at Kshs 36.3 bn, a performance rate of 181.7%, but Treasury only accepted bids worth Kshs 19.5 bn. The average yield of accepted bids came in at 14.3% against our projections of between 13.0% - 14.0%. The yield came in higher than the 5 Year reopened bond, which came in at 13.9%. This is attributable to the fact that investors are seeking a premium for their investments due to the slight increase in the perception of risk in the financial markets in the wake of the closure of banks. The US Fed is scheduled to meet on 26th-27th of this month and we expect the Fed to keep rates stable for now. Despite recent month on month reports showing more than expected job creation in the economy, a great vote of confidence by employers in the US economy and the rise in hourly wage rates by 0.3% in March, the Fed is likely to maintain the rates during the month. The soft global economy and the strengthened dollar are not only having repercussions on US exporters but also seem to be restraining business investment spending and further rate hikes would only make US exports even less competitive. For the month of April, we expect inflation to ease to 5.5%-5.6% from 6.5% in March on account of lower fuel prices following the Energy Regulatory Commission lowering the recommended pump prices for petrol by 5.7% to a 6-year low retail price of Kshs 80.7 in Nairobi. a steep decline in payroll taxes with many large organizations laying off staff citing higher financial costs and cheaper commodity substitutes from India and China and coupled with the fact that the government has also frozen recruitment of non-essential staff. On foreign borrowing however, the government had planned to obtain Kshs 401.7 bn during the fiscal year and had attained Kshs 207.0 bn by December. Plans have been put in place to raise additional funds from the foreign markets which include (i) a USD 600 mn loan from China, (ii) a bilateral loan from France to finance infrastructure projects in roads, energy, security and financial inclusion to the tune of USD 282.7 mn, and (iii) the expected Eurobond to be issued in the coming months, demonstrating that the government is on track towards filling the overall budget deficit. Should the government miss on its foreign borrowing financing target, it would then induce pressure on the interest rates as it would have to dig deeper into the domestic market to fill this gap. While KRA collections are below target, the deficit is offset by domestic borrowing which is way beyond the target and will further supplement any shortfalls in foreign borrowing. The government is ahead of schedule with its borrowing programme, having borrowed Kshs. 248.5 billion for the current fiscal year compared to a target of Kshs.178.1 billion (assuming a pro-rated borrowing throughout the financial year of Kshs. 219 billion budgeted for the full financial year). This shows that the government has surpassed its domestic borrowing target, and will therefore shift their attention to achieve the foreign borrowing target. However, failure to borrow in the foreign markets may lead to upward pressure on domestic rates as domestic borrowing is increased. Interest rates have dropped since the beginning of February 2016 due to (i) reduced pressure on government borrowing, and (ii) high liquidity in the market. With interest rates coming down, we advise investors to lock in their funds in short to medium-term papers of tenors between six months and one-year, as the rates are attractive on a risk-adjusted basis. During the week the market was on an upward trend with NASI, NSE 20 and NSE 25 gaining 1.0%, 2.3% and 1.5%, respectively. This was on the back of gains in large cap stocks such as EABL, Safaricom and Bamburi which gained 3.7%, 4.9% and 8.0%, respectively. The top movers for the week were Safaricom, Equity Group and KCB Group, which accounted for 64.2% of market turnover, while Safaricom recorded the highest net foreign inflows of USD 2.2 mn with KCB Group having the highest net outflows of USD 2.0 mn. 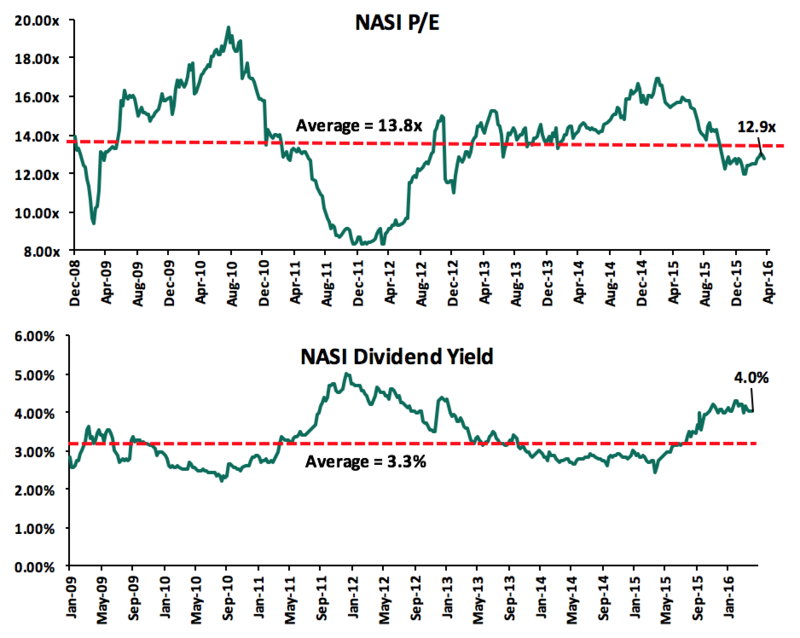 Since the peak in February 2015, NASI and NSE 20 are down 16.9% and 27.1%, respectively. Equity turnover rose by 66.6% during the week to USD 33.2 mn from USD 19.9 mn last week. Foreign investors were net buyers with net inflows of Kshs 343.4 mn compared to net outflows of Kshs 77.0 mn last week, on the back of favorable valuations and reinvestment following the earlier weeks? net outflows. Foreign participation increased marginally to 68.7% from 66.7% last week. The directors have recommended a dividend of Kshs 0.30 per share, maintaining the payout year on year. In light of the difficult operating environment last year, Britam reported respectable results, which were better than what the market anticipated, with investors having priced in the expected results, hence the 15.2% appreciation in share price since their reporting. In fact, our equities trading desk bought the stock at Kshs 11.7 immediately after they released results. For more earnings details on Britam Holdings Limited earnings, please see our earnings note at: Britam Holdings Limited Earnings Note. The Treasury has announced plans to acquire an additional stake in Kenya Airways through conversion of the Kshs 20.2 bn debt to equity in a move set to reduce the financing costs of the airline. The airline is currently facing (i) restructuring difficulties due to losses in operational business, (ii) record debt levels of over Kshs 167.9 bn, and (iii) growing losses currently at Kshs 12.0 bn as at H1?2015. The rate of conversion of this debt into equity has not yet been disclosed. The airline currently has a negative equity position at Kshs 33.9 bn, and a market capitalization of Kshs 6.1 bn. The government which is currently the largest shareholder with a 29.8% stake in the airline, also holds majority stakes in Uchumi Supermarkets at 23.2% and 20.0% in Mumias Sugar, companies which are currently loss making, and have been held afloat by government bailouts in the past. This highlights the need for privatization of these companies to bring in strategic investors who will be able to turn around the companies. We note that government injection of funds into these companies will not solve their performance issues, since the businesses require more focus on change of strategy. A full privatization would bring private sector discipline to these companies. The Nairobi Securities Exchange announced changes to the constituents of the NSE 20 Index with effect from 19th April 2015. The index which was established in 1964 is a price weighted index, constituting companies selected based on a weighted market performance during the period under review that looks at: (i) Trading activity measures i.e. market capitalization, shares traded, deals/liquidity and turnover with a weighting of 4:3:2:1, respectively, (ii) Free float of at least 20%, (iii) Market capitalization of above Kshs 20.0 mn, and (iv) Profitability and dividend track record. Given most of Chase Bank?s customers will want safety and withdraw their deposits once the bank opens up for business, KCB Group is engaging the customers in a bid to retain them and offer continuous support while engaging Central Bank where need be, for liquidity support. The acquisition, which is subject to due diligence, shows the interest and seriousness of the regulator Central Bank to enforce consolidation measures in the Kenyan banking sector which is currently overbanked. As highlighted in our Cytonn Report #14, there was need to urgently and speedily resolve the quagmire that would in effect impact the overall economy. We expect to see more consolidation efforts in the remainder of the year as tighter supervision and regulatory measures are implemented. We remain neutral on equities given the significantly low earnings growth prospects for this year. The market is now purely a stock picker?s market, with few pockets of value. PROPARCO, a French Development Agency and DEG ? the German Investment & Development Company have exited their combined 10.68% equity stake (4.43% and 6.25%, respectively) in I&M Holdings to CDC Group Plc, the UK?S development finance institution. PROPARCO and DEG exit value is estimated at Kshs 4.5 bn given I&M market capitalization of Kshs 42.0 bn and an estimated IRR of 45.6% from an equity investment of Kshs 337 mn in 2007 and Kshs 1.7 bn in 2010. I&M Holdings is a financial services conglomerate in banking and insurance industry in Kenya, Rwanda, Tanzania and Mauritius and is actively pursuing growth opportunities in other African countries. Most recently, the SME lender placed a bid to acquire Giro Bank and Burbidge capital as it diversifies its revenue streams. It is also perceived to be one of the very stable and well governed banks at a time of volatility in the sector. Financial services sector in East Africa remains a bright spot on the back of (i) improved supervision by regulators, (ii) regional integration which has created a wider market for the financial institutions, driven by low financial inclusion, (iii) alternative distribution channels such agency and mobile banking, and (iv) ease of exits by investors. Other recent investments by CDC include; the Garden City Mall, a real estate development in Nairobi, the Akiira geothermal plant and investment in CRDB Bank, Tanzania?s leading provider of financial services. Kibo Capital Partners, a Mauritius based private equity manager has invested an undisclosed amount in General Cargo Group, a leading logistics provider in Kenya through its Kibo Fund II. In this deal, Kibo has partnered with Velogic, a Mauritius based regional logistic company who will gain entry into the East Africa market. General Cargo will benefit from Velogic?s best operational practices and systems to accelerate growth and improve the quality of service. Kibo fund II is a 10 year closed-end generalist private equity fund targeting fast-growing SMEs making equity and quasi -equity investments of between USD 4-10 mn across the financial services, healthcare, education, FMCG and light manufacturing industry. Kibo partners has USD 100 mn assets under management, with fund II having held its second close in January 2016 at USD 58 mn and seeks to raise USD 80 mn by the final close. The logistics industry in the region is poised for growth on the back of (i) integration of technology in business, (ii) infrastructural investment such as Standard Gauge Railway and the LAPSSET Corridor in Lamu that will connect Kenya to the neighbouring Eastern Africa countries, and (iii) growth of middle class who have pushed up demand of goods and services which are hinged on logistical services. Private equity investment in Africa remains robust evidenced by the increase in number of deals and deal volumes in the region especially in financial services, energy, FMCG, real estate and technology sectors. Given (i) the abundance of global capital looking for opportunities in Africa, (ii) the attractive valuations in private markets compared to public markets, and (iii) better economic growth projections in Sub Sahara Africa compared to global markets, we remain bullish on PE as an asset class in Sub Sahara Africa. With the first quarter of 2016 coming to an end, the real estate market has recorded mixed results in the various segments. The residential market has managed to remain the most attractive real estate segment and this is supported by findings announced during the release of reports by Knight Frank and Hass Consult. Over the last five years, Real Estate has continued to be the most preferred investment option among individuals and investors owing to the fact that it has higher returns at approximately 25% per annum total returns, in comparison to other asset classes that give returns of averagely 14% per annum. The high returns for residential property can be attributed to high housing demand and housing deficits, which are propelled by the increasing urbanisation rates far outpacing the rate of supply. The world fact book indicates that in 2015, 25.6% of Kenya?s population was living in urban areas with the rate of urbanisation estimated at 4.3% between 2010 and 2015. This performance has attracted the attention of institutional investors whereby a considerable number has ventured into the property market and diversified their respective portfolios. Property prices for residential units have continued to increase particularly for semi-detached houses whose asking rent have increased by 17.1% as indicated by the Hass Consult Pricing Index. The report indicates that satellite towns, such as Athi River, Ruaka and Ruiru continue to be the most attractive places to invest as evidenced by an average increase in land prices by 1.1% over the first quarter of 2016. The Nairobi suburbs on the other hand, performed poorly in the first quarter with a decrease in land prices by 0.2% with Eastleigh being the worst performer at a 7.5% decrease over 3 months. The reason for the dismal performance in Eastleigh can be attributed to security concerns associated with the area in the wake of terror attacks in the country. In contrast, Donholm recorded a 9.3% increase and this could be attributed to the upgrading of the Outer Ring road that will link Thika Superhighway and Mombasa road. According to the Hass Consult House Price Index, house prices on the other hand increased by 4.2% for the quarter and 14.6% over the year which is the highest increase in the past 5 years. Lang?ata, Karen and Athi River experienced the highest house price increase at 5.4%, 5.2% and 4.9%, respectively. Rental prices increased by 1.5% for the first quarter and 5.5% for the year with Westlands having a rental decline of 2.5% for Q1 2016 and a 0.8% decline for the year. The report by Knight Frank indicates similar performance with an annual increase in the rental prices of 5.1% in 2015. The report points out that the high-end market witnessed an annual growth of 2.9% in 2015 as opposed to a 1.1% annual growth for a similar period in 2014. The great performance in the residential sector has continued to attract investors who seek to diversify their portfolio and venture into real estate as opposed to other investment options often characterized by financial turbulence. The performance of the formal retail market could be declining as indicated by the Hass Consult report. Despite an increase in annual yields from 10.0% at the end of 2014 to 11.5% in a similar period in 2015, there has been a marked decline in the uptake rate by 45% for the 2nd half of 2015 in comparison to the 1st half of 2015. The decline can be attributed to a possible oversupply of formal retail space in the specific submarkets within the Nairobi metropolitan region. The commercial office market on the other hand has posted a modest decline with the occupancy of Grade A office space decreasing by 5% in the 2nd half of 2015 as compared to the preceding 1st half. The report by Knight Frank further indicates that this is a 40% decline as compared to a similar period in 2014. The absorption rates for office space could dip further following external shocks in international markets particularly the oil and gas industry which has reduced the number of investment offices coming and reduced activities of government agencies. The players in the oil and gas industry are seeking to downsize their operations and pull out of Kenya altogether. Government institutions who also take up a considerable amount of Grade A office space may not require it by the end of the year. The Transitional Authority and Constitutional Implementation Committee (CIC) are some of the agencies whose terms come to an end this year if their tenures are not reviewed. The passing of the Entities Bill could see the downsizing of parastatals as well as devolving some of them to County levels in bid to cut on expenditure. Despite this, players in the industry will continue to supply office space in Nairobi which is estimated to be slightly above 3 mn square feet in 2016. The foreseen poor performance has however not been reflected in the rental asking prices which remained relatively stable throughout 2015. From the commercial office report we released in February, we had predicted a possible undersupply of office space in the next two years only if the absorption rates remained the same. The market conditions have since changed and this could affect Grade A offices which constitute approximately 30% of the total office space. The unprecedented changes in occupancy will result in reduced escalation rates for new leases and subsequently reduction of asking rents in a bid to accommodate an entirely different market which constitutes Small and Medium Enterprises. As for the satellite towns, they will continue being the preferred place to invest mainly due to improved road infrastructure. The expansion of Ngong road will cause land prices in the areas served to shoot up as it was the case for Thika Super highway. The completion of the Southern bypass will also cause an increase in property prices in areas that it will serve. In order to attract tenants for commercial offices, the developers could consider targeting the Small and Medium Enterprises as potential tenants as opposed to multinationals and parastatals. In September 2015, see Cytonn Report #37, we did a focus note on the mortgage market in Kenya, essentially looking at why the uptake of mortgages remained low; currently at only 22,000 mortgages for a country of 44 million people with the total mortgage values equating to 2.7% of GDP, compared to, say, South Africa, where mortgage values to GDP equal about 24.2%. For a country of 44 million people, with a population growth rate of 2.4% p.a, an effective housing deficit reported to be 200,000 per annum, with an increasing disposable income and a growing construction and real estate industry, it is a contradiction that mortgage uptake remains very low. Especially given that the real estate sector contribution to the GDP has grown from 8.0% in 2010 to 14.5% in the last quarter of 2015 while the sector?s total return remains very attractive at about 25% p.a over the last 5 years. To understand the contradiction from a quantitative perspective, our Real Estate Research team, which supports both our Real Estate Investments and Real Estate Development teams developed the Cytonn Mortgage and Rental Affordability Index for the Nairobi metropolitan area. Using market data from the Nairobi Metropolitan area on house and rental prices, we constructed indices to gauge the affordability of mortgages and rents in specific locations. The purpose of the research is to inform households on the areas they will find affordable to purchase mortgages and / or rent houses based on their levels of income and the corresponding house and rental prices in those areas. The Mortgage Affordability Index is a tool used to measure whether the average income earned by a household is enough to enable a household to purchase a house with a mortgage option. The Rental Affordability Index is a tool used to measure whether the average income earned by a household is enough to enable a household rent a house in a given location. In the computation of these indices, the key factors under consideration are household income, house prices, locations in Nairobi and the metropolis, and monthly payments for mortgages and rent. The index value is obtained by dividing the qualifying income by the median household income. The qualifying income is obtained by dividing the monthly mortgage payments by 40%. The assumption being made here is that households spend a maximum of 40% of their income on mortgage payments. An index of 100 or above indicates the most affordable areas, while that of below 100 to 0 indicates the least affordable areas. Mortgages are unaffordable in all areas of the Nairobi Metropolitan area, with the metro having an index of 66. Mortgages in Satellite Towns are almost affordable with an index of 91. High Income areas have the least affordable mortgages with an index of 42. A median household income of Kshs 200,000 can afford to buy a house on mortgage in Satellite Towns and in Kariobangi, Buruburu, Embakasi and Umoja. In high-end areas a minimum monthly income of Kshs 3.1 million is needed to afford a house on mortgage. Rents are affordable in all areas of the Nairobi Metropolitan area except the upper middle. The Nairobi metro area has a median rental affordability index of 132. Rents are more affordable than mortgages in all areas of the Nairobi metropolitan area. With most areas requiring an income range of 50,000-150, 000 to afford rental rates. In conclusion: With no area in Nairobi and the metropolis having an index score of 100 and above for the mortgage market, the analysis demonstrates that the market is not geared towards mortgage buyers, hence the core reason why the number of mortgages remains low at 22,000 for a country with a population of over 44 million people. The major reasons behind this are (i) low incomes levels that cannot service a mortgage, (ii) high property prices, and (iii) high interest rates, which discourage potential homeowners from borrowing. Consequently, Nairobi and the metropolis area still remain largely a rental market. This also explains why most real estate developments are bought by real estate investors who in turn rent them out to households. The recent emergence of REITs in Kenya will be critical to providing more of the badly needed housing as it will bring in more institutional capital that can finance more developments for rentals.